ST. LOUIS, Nov. 8, 2018 /PRNewswire/ -- Universal Air Filter, the leader in electronics air filtration and EMI shielding, introduces the future release of its Series 2 Outside Plant Filter (OSP). Offering UL900 classification at increased air flow, OSP Series 2 delivers protection from dust, wind-driven rain and salt fog. "Our customers develop applications that need to perform in diverse conditions," said Dan Krupp, President of UAF. "With its performance, low pressure drop, UL compliance and flexible design, OSP Series 2 creates a lot of new design options for equipment operating in harsh environments." OSP Series 2 improves upon UAF's current OSP filter that the world's top telecom providers, power generation equipment producers, interactive signage manufacturers and dozens of 'Internet of Things' developers rely on today. "UAF's OSP filters deliver superior water and airborne contaminant protection for products such as interactive kiosk displays to communicate with residents and visitors in cities all over the world," said Chris Picha, UAF Lead Mechanical Engineer. "We're excited about the improvements in the 2nd Series OSP Filters." Custom OSP Filters keep dust, water, wind-driven rain and salt fog out of electronics enclosures utilizing direct air cooling systems. Cabinets for telecom, wireless, digital signage, and power applications can now use outside air vented cooling systems in place of costly, inefficient, closed-loop air-to-air heat exchangers. 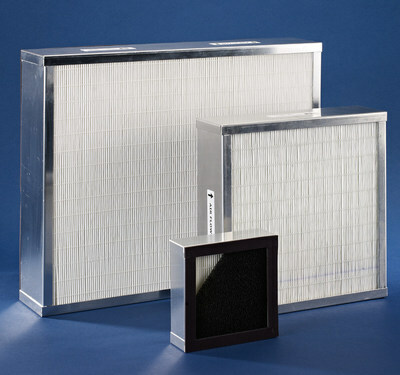 OSP Filters are compliant for use with industry standards including UL 900, GR 487, NEMA, and IP enclosure ratings. In addition to the OSP filters already available, UAF has other water-repellant solutions. UAF Quadrafoam with hydrophobic mesh provides water repellency in a low-profile assembly. For other indoor and outdoor environments, UAF offers a portfolio of filter media in a durable framed assembly - metal or flame-retardant, flexible polypropylene. UAF stands ready to provide engineering support with filter media selection, design specification assistance, 3D CAD models, and to size, to spec prototypes - all free of charge! Headquartered in Sauget, IL, UAF is in the Indoor Air Quality division of Filtration Group - the world's leading filtration company. Filtration Group is a globally recognized brand, serving many of the world's best-known companies throughout North America, Europe and Asia. Visit UAF at Electronica 2018 in Munich, Germany, November 13 - 16, or click to request more information or schedule a meeting.